The Odyssey for Equality is on the Road Again! Dr. Brown engages participants in his sessions in discussions about these topics with a focus on what can be done to deal with our society’s current “war on men and boys,” and to ensure that men and boys achieve a greater degree of equality in our highly-feminized society. Dr. Brown is the author of Rescuing Our Underachieving Boys, and several other publications dealing with how parents, the education system and society in general can help to deal with the crisis faced by men and boys in the current climate in society. His books will be on sale and he will be autographing them at these sessions. The Odyssey for Equality 2016 will be in Oshawa on July 19, Brockville on July 20, Kingston on July 21, Ottawa on July 22 and Montreal on July 23. Watch for further details, and more dates and locations! Gizmo and the boys will be there, signing books and answering your questions about Rescuing Our Underachieving Sons. 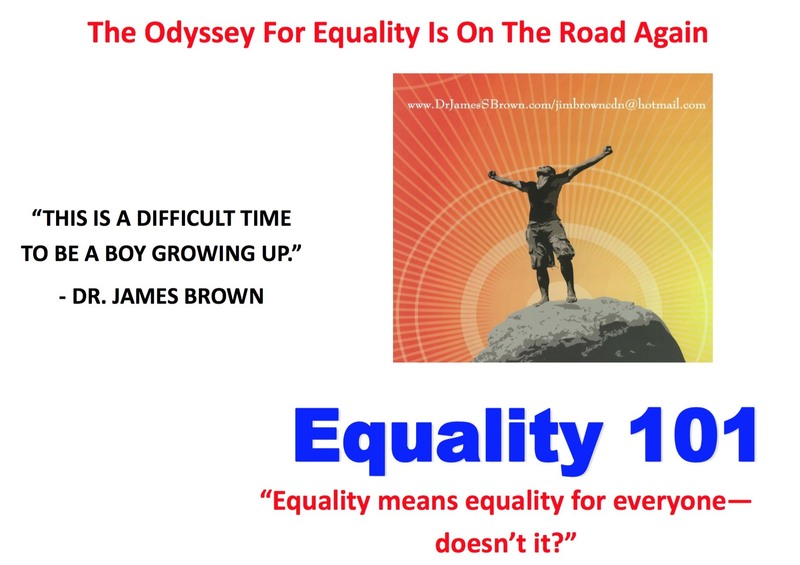 The Odyssey for Equality 2016 will be begin in Oshawa on July 19 with a public lecture dealing with an overview of what the Canadian Association for Equality is all about, and how its work is important for men and boys, and also for the entire community. Admission is by voluntary donation. Date and Time: Tuesday July 19th at 6:30 pm. Location: Rm. 509, Hamelin Building, University of Ottawa, 70 Laurier Av., East. There is no admission fee and ASL services will be available upon request. Come out to discover what CAFE is all about. Location: Restaurant Pizzaiolle, 4801 Saint-Denis (corner Gilford, metro Laurier). Dr. James S. Brown, M.A., M.Ed., Ed.D., is a Canadian parent, grandparent, great grandparent, teacher and academic who has worked in every job in education, including as a teacher and principal. Dr. Brown holds six university degrees, including a doctorate in education, and also has diplomas of advanced studies in curriculum, instructional leadership, counselling and applied psychology .He is the author of a number of books dealing with the challenges facing boys growing up in our current society, including “Rescuing Our Underachieving Sons: Raising the Aspirations of Underachieving Boys.” Dr. Brown is the president of the Canadian Association for Equality, and has been travelling in Europe, the United Kingdom and the United States, and across western Canada on his Odyssey for Equality over the past five years. This year, his Odyssey is taking him to Ontario, Quebec and eastern Canada. As part of his Odyssey, he has made over 70 presentations to live and online audiences, and has been interviewed extensively on television and radio, and for newspapers and magazines.